Expect Xtreme gain when you combine two 4 bay bowties to get this monster. With a bowtie you get maximum mileage for minimum size. 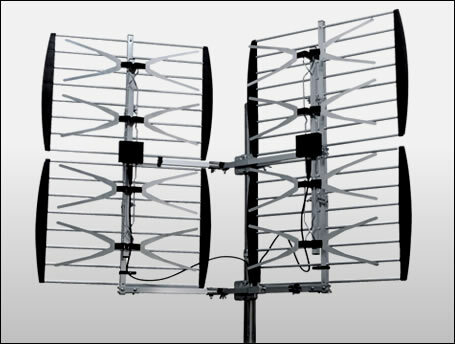 Great for low profile setups, the 8 bay bowtie is effective at pulling in weak long distance TV Stations. If you want long range directional ability aim both panels in the same direction for a 60° beam. If you want to receive two cities at the same time, you can direct each panel individually! The best choice for distant signals … the HDB8X’s unique design will pick up signals that other antennas can’t! There's a lot of free HD out there. Make sure you get the most HD channels by getting the strongest you can buy, the Xtreme Signal series. If you are more than 45 miles from your closest broadcast towers you will appreciate the sheer power of the Xtreme Signal HDB8X. This super deep fringe antenna is designed to focus in on those distant signals like no other. It’s the hobbyist’s choice for clean, clear signals no matter what the distance. Antenna hobbyists, rejoice! There’s a new choice for high-gain, wide pattern UHF reception that gives you all the power you need in a space-age package that won’t break the bank and mounts easily to a wide variety of masts. What could be more satisfying than knowing that with a single investment, you’ve saved thousands of dollars in future cable bills? Most markets have dozens of free channels and you don’t need to be left out just because you choose to live in a distant or rural area. You’ll find awesome performance from up to 60 miles away! The HDB8X from Xtreme Signal is the best choice for you because its sturdy, durable construction will give you years of enjoyment. Its compact design keeps wind resistance down and mounts easily on an existing mast or any vertical surface. Aiming is easy and the unique reflector design lets you easily confirm line-of-sight while standing behind the antenna. In the past, free TV fans who lived fifty or more miles from the broadcast towers had to make do with massive Yagi antennas that were difficult to erect and aim, and looked unsightly over time. You’ll sacrifice nothing with the HDB8X’s compact design, sure to keep its modern, clean appearance for years to come.